MADRID (AP) — Former Barcelona president Sandro Rosell denied money laundering charges in court on Tuesday, saying he did nothing illegal in relation to the sale of TV rights for matches involving the Brazil national team. The former Nike executive in Brazil, who presided over Barcelona from 2010-14, has been accused of misappropriating funds coming from the sale of TV rights and the organization of friendly matches featuring Brazil as well as from a sponsorship contract between Nike and Brazil. He is also charged with forming part of a criminal organization. Spanish prosecutors are seeking an 11-year prison sentence, plus a fine of nearly 60 million euros ($68 million). Prosecutors say Rosell helped launder nearly 20 million euros ($22.7 million) related to commissions for the Brazil matches during the time embattled Brazilian soccer confederation president Ricardo Teixeira was in charge. He is accused of keeping at least 6.5 million euros ($7.3 million) from that money. “There were no commissions, neither illegal nor legal,” Rosell said while answering questions by his lawyers. He was not expected to face questions from prosecutors. Rosell said it was “absolutely false” that he helped launder money for Teixeira, although he admitted he entered into a few business investments with the Brazilian soccer official. He said they had nothing to do with the contract for the Brazil matches. He also admitted Teixeira loaned him money to help pay for an apartment, which he said he paid back with interest three years later. Prosecutors say that loan was part of the money laundering scheme involving Rosell and Teixeira. Teixeira, a former FIFA executive committee member, was indicted by U.S. authorities in 2015 as part of the soccer corruption scandal. He has also been investigated by Brazilian authorities. Rosell said the company he worked for, Saudi Arabia conglomerate ISE, reached a deal with the Brazilian confederation to pay $1.15 million to organize and hold TV rights for 24 Brazil matches. By the agreement, Rosell said his own company would earn $250,000 after each match was played. He said his contract with ISE ended after 14 matches because he decided to run for the Barcelona presidency, which meant he relinquished $2.5 million he would have been entitled to for the rest of agreement. Rosell said he became a much bigger target for Spanish authorities since he became Barcelona president. He said he was subjected to more than 50 inspections by tax authorities since then, and continues to be targeted by them until now. He said his relatives also have been targeted. 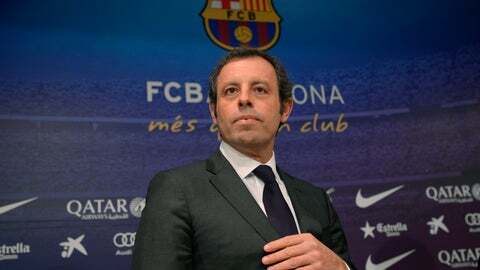 The charges against Rosell are not directly related to his time as Barcelona president. He is also involved in another case related to Neymar’s transfer from Brazilian club Santos to Barcelona in 2013. Corruptions charges have been brought after a Brazilian investment group said it received a smaller compensation because part of Neymar’s transfer fee was concealed by those involved. Rosell has been in custody since his arrest nearly 21 months ago. He arrived in handcuffs for the first day of the trial on Monday. The whole trial is expected to last 10 days with different sessions through March.